Small product; Big Impact. The MealGear™ MicroBites™ join our stainless steel bottles as part of our C-minus™ program. Every MicroBites set will carry more than 25lbs of verified green house emissions reductions — making MicroBites not just carbon neutral — but carbon negative. 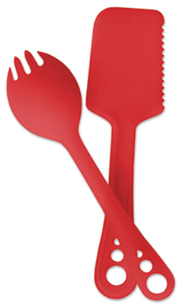 A fun, ‘micro’ version of our popular Utensil set. At 6 inches, it can nest into most camp cookware sets.